The only drawback to the Speed Nose on the Dynafit TLT7 boots is that it doesn’t support crampons with automatic toe bails (the simple wire that wraps around the toe welt). The solution is to get a semi-automatic crampon, or modify your auto with this adapter. Remove the simple wire bail and replace it with this gizmo that fits into the toe fittings and securely wraps over the top of the boots. The mod is rated at easy to moderate difficulty, depending on whether the bail on your crampons is designed to be removed. 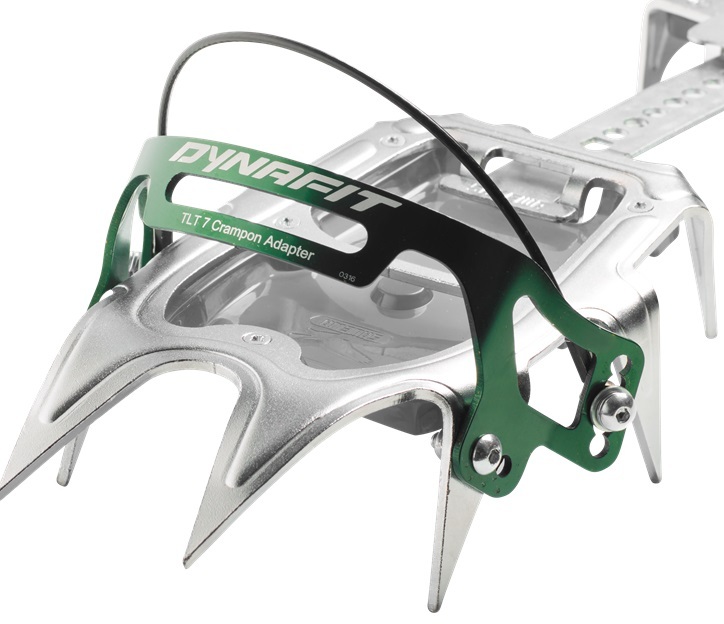 Enjoy all the benefits of Speed Noses and automatic crampons attachments with the TLT7 Crampon Adapters. Sold in pairs. Hello Ben, There is a bit of craftsmanship involved in mounting these, but it is possible. The same question was asked and answered by a customer below fyi (look at the one dated 3/27/2018). This is great in concept but it has two major issues. The first is that the attachment bolts for the cable that goes over the top wear holes in the side of the boot. After four days using the crampons I think they have almost worn through the side of the boot. The second is that when kicking into ice, the toe of the boot rides over the front of the adapter. This results in unusably short front points and makes it impossible to take the crampon off without taking the adapter apart. It would have been a really bad had I not brought the allen key to the top of Mt Baker. I will definitely be complaining to Dynafit about this. FYI I used the adapter with a size 28.5 boot and BD sabertooth crampons. Yikes, that's definitely not a whole lot of fun, sorry to hear that. Have you played with the toe bail location at all? I'm not a leading authority on the Sabertooth by any means so take this with a grain of salt, but it's common on a lot of crampons to have two toe bail mounting locations so you can tinker with the front point "length" and it looks to me like there are two locations for the toe bail. If the crampon adapter was mounted in the one that's further back it would do two things: not allow the aluminum bail to pivot down so far which would mitigate your boot sliding out, but it'd also tighten the "instep" cable enough that it wouldn't let your boot slide so far forward. If that extra hole is just a clever weight savings cut-out and I'm misinterpreting it then disregard. At any rate, sorry to hear about the trouble and feel free to email us or give us a call with any more questions or concerns. Thanks for the reply and the ideas! I originally had it mounted on the rear hole but that had too much front point out (this makes it awkward to climb ice). I think the issues come from the shape of the sabertooth. First off the crampon is too narrow which doesn't allow the boot to sit right all the way forward in the adapter. Also, the toe bail hole is too high for the shape of the adapter which makes the whole adapter lean forward. This is likely the cause of both of the issues I pointed out in the review. Update: I contacted Dynafit about the boot damage and they replaced the boots with a new pair! I'm still looking for a good crampon solution for this boot though. Hey Charles! Oh dang, no kidding? I mean that's probably the best case scenario considering the situation, but it's still super annoying that it even came to that. If I find a clean crampon solution that goes above and beyond just the standard semi-auto route I'll make it a public announcement of sorts and then send you an email. Sorry again about all of the trouble. The best solution is different boots. I broke the adapter day one. Since then I've been using a rigid rear heel bail for my Petzl Leopard crampons and the rubber toe bail that came with the crampons. If you are sure to run the crampon retention strap through the toe bail, the crampons will stay on your feet. I still wouldn't climb ice with them. Overall, Dynafit screwed up big time with this no welt toe, in my opinion. I think I answered my own question. It is kind of a force fit after screwing in one side. Screwing in the other side seems to form it into place. It looks fine. Will test it this weekend. Hey, I am strongly considering the TLT7 as my new backcountry boot. But I have some concerns about this crampon adapter. I worry that it won't work as well as a traditional boot crampon. I primarily use my set up to climb and ski Mt Hood. Functional crampons are a must and failure could be annoying at best, and very dangerous at worst. Has anyone had experience with crampons and this adapter? It's a lot of $$ to invest if it doesn't end up working out. Thanks!! Hi Cully, we've had a number customers with your concerns. This crampon adapter has worked very well for a lot of people. If you really doubt it, you can always go with a semi-auto crampon. I've found that the CAMP XLC Nanotech with the semi-auto bail fits the TLT7 very well and entirely secure. Hey Luke! The compatibility is pretty much unmatched with these things, we've been really impressed and haven't seen anything that hasn't worked with it yet. As for the crampon itself, it kind of depends on exactly what you're looking for. If you're bashing them on rocks and ice all the time, but want a lightweight crampon, the Petzl Irvis Hybrid Crampon is seriously impressive. If you just find yourself booting up couloirs and occasionally scrambling around on rocks for a minute or two, we have all fallen in love with the lightweight and extremely compact Petzl Leopard. Do they work with Petzl Irvis Leverlock? Hey Youyou! Absolutely, but I think the Irvis comes with Petzl's flexible toe bail, doesn't it? If it does then just use that, it'll function the same! Will these fit Black Diamond Sabretooth Crampons? Hey Chris! Thanks for reaching out! In theory, yes absolutely as long as you're willing to modify your crampon to a certain extent, but we haven't tried that exact crampon combo yet so we're not sure. The good news is that we haven't found a crampon that it doesn't work with yet! Some of the toe bails aren't designed to be removed, but it looks like the Sabretooth crampons shouldn't have any issues as the toe bail pivots. I have seen two versions of this product? Is this the newer version? Do you have a weight for this? Thanks! Hi Mike, this is the only version that has hit production. The adapters weigh 28 grams per foot, including the hardware.